Digital Health is the convergence of the digital and genetics revolutions within medicine and health. The goal of digital health is to ultimately improve the quality of our healthcare and our daily lives. By adopting new technologies such as wireless sensors and trackers, healthcare can become more efficient, cheaper and more accessible. Consumers have already been seamlessly integrating digital health tools into their daily lives to monitor and improve their health. Fitness Trackers and Smart Watches are being used to measure everything from how many footsteps you’ve taken that day, number of calories burned, distance travelled, heart rate, blood pressure, and even time spent sitting, providing instant results. Digital Health and wearable tech are increasingly important to businesses and consumers alike. Fitness tracking app MyFitnessPal – which has 75 million users – was recently acquired by Under Armour for $475 million, health information website WebMD gets 80 million visitors a month, and Apple has reportedly placed its first order of 5-6 million units for the Apple Watch (which includes a heart rate sensor and health apps) and will launch in April 2015. The popularity of Digital Health is big business with sustained levels of growth predicted for the future. Below you can see a network map of the online conversation around digital health, which has sky-rocketed in the past three years. We captured data from 32,549 users. Be sure to click on the map to enjoy the full size network diagram in greater detail. A high quality version is also included in the full report that you can download by clicking the blue button below! 1. Do you think the demand for Doctors will decrease or do you feel there will always be a need for real communicators providing guidance? Artificial intelligence and clinical decision support tools are becoming more polished, powerful, and integrated into the healthcare world every day, so the potential for automating many healthcare provider tasks is an important consideration. Of course even with greater efficiency in care delivery, there will still be the need for primary care doctors, nurses, and others, but the resource requirements can be reduced as tasks become more automated via digital tools. For instance, remote patient monitoring, telehealth, and medical diagnostics enable care teams and doctors to see more patients reduce office time and decrease the pressure on the healthcare system. All these support tools will make the healthcare delivery process more efficient, plus with digital health monitoring, tracking, and coaching solutions, consumers are becoming more empowered to prevent chronic disease and mange existing conditions. The CDC (Centers for Disease Control and Prevention) has even indicated that digital health tools can help prevent diabetes. 2. 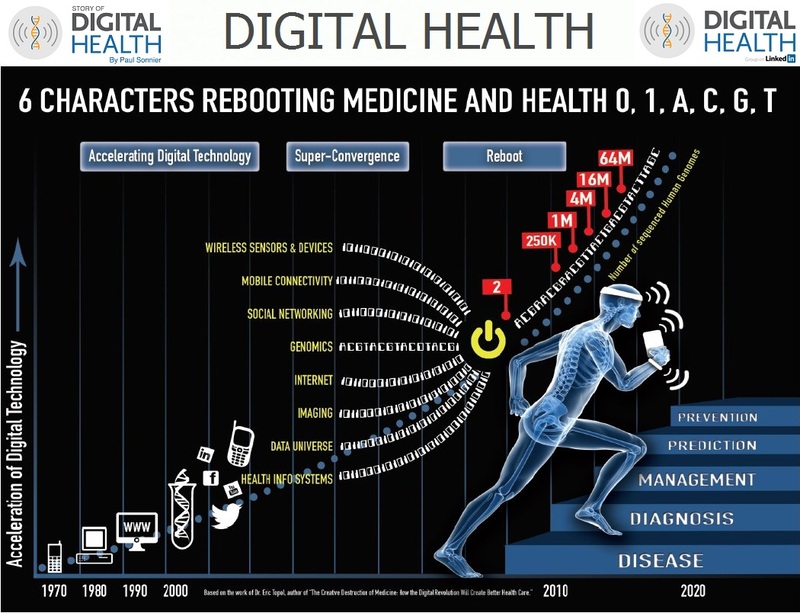 Where do you see Digital Health in 2025? Thanks to advances in genomics and genetic testing, patients are being diagnosed more accurately and medicine is becoming much more precise. Digital tools are also enabling disease prevention planning based on genetic risk factors, from heart disease to certain types of cancer. Consumers and patients can now take more control over their own health and healthcare. The FDA (Food and Drug Administration) recently approved the marketing of consumer genetic testing company 23andMe’s test for Bloom Syndrome, which allows for risk-based family planning. This is DTC (direct-to-consumer), which means it doesn’t require a doctor’s order for the consumer to be better informed of their health. In the next ten years we’ll see more of the above taking place, scaling into many millions of people, and the addition of predictive analytics and real-time disease diagnostics derived from ongoing health monitoring. We’ll see a range of wearables, plus even implants to detect disease biomarkers. While we may not see a cure for cancer, with Digital Health we can detect it much earlier, which is often tantamount to a cure. 3. Will digital health extend our life expectancy? Chronic disease prevention is hard to measure since there aren’t any long term studies yet related to Digital Health. But, with ongoing research that shows what helps or hurts our health, we are able to evolve solutions to help us prevent and better manage diseases such as obesity and diabetes. As a result, empowered patient will be less likely to have a heart attack, for example. Regardless of whether or not you’re life is extended, the important thing is that your quality of life is improved. Dr. Ezekiel Emanuel recently authored a salient piece on this subject in The Atlantic, which I agree with: “Why I Hope to Die at 75: An argument that society and families—and you—will be better off if nature takes its course swiftly and promptly”. 4. What else do you see as significant in Digital Health? I think the recent announcements by Apple have had a profound effect on the global Digital Health ecosystem. In fact, in aggregate, Apple has moved the needle for the entire space. For starters, the Apple Watch – which has a heart rate sensor – isn’t even out, but there are already health, fitness, and even medical apps that will be available for it. A couple of noteworthy examples include RunKeeper, for tracking your runs and motivating you to keep fit, and Dexcom, which displays real-time blood glucose readings sent from their wearable tech medical device for diabetics. Furthermore, they’ve introduced a new ‘ResearchKit’, which is an open-source framework service for medical studies that helps researchers collect data from the company’s customers. Immediately after the event I spoke with CNBC TV reporter Bertha Coombs, who quoted me in her article “Apple’s ResearchKit: Gamechanger for digital health care?” As I told Bertha, Apple has the size, influence, and they’re integrating across consumer digital health to medicine, which is totally unprecedented. ResearchKit is for iPhone and enables researchers to design and administer app-based studies. The first five apps built with it are designed to study asthma, breast cancer, cardiovascular health, diabetes, and Parkinson’s disease. Amazingly, right after the event, more than 10,000 participants signed up for a Stanford cardiovascular medical trial. HealthKit is already the market leader among hospitals looking to move data from patients’ at-home devices to their electronic health records. As of Feb 2015, there were already 14 prestigious hospitals doing pilot programs of HealthKit, with many more to follow. Then there’s HealthKit, which allows apps that provide health and fitness services to share their data with their consumer Health app and with each other. A user’s health information is stored in a centralized and secure location and the user decides which data should be shared with your app. Obviously this data is also integral to the ResearchKit tools. Apple also has its own native consumer health and fitness apps on iPhone and Watch. According to the company, Apple Watch “measures all the ways you move, such as walking the dog, taking the stairs, or playing with your kids. It even keeps track of when you stand up, and encourages you to keep moving. Because it all counts. And it all adds up.” Indeed all of that does add up and I have to hand it to Apple for stating it so simply and eloquently! In point of fact, researchers have discovered how important physical activity is for our health and reducing our risk of disability, diabetes, heart disease and cancer, and obesity. Putting together all that Apple is doing — ResearchKit, HealthKit, their consumer Health app, and wearable tech Watch — and we’re really seeing Apple leverage its market dominance and brand equity to drive an integrated digital health ecosystem across stakeholders, including consumers, healthcare providers and health systems, health IT solution providers, and researchers. This is profound and opens up major opportunities to accelerate digital health adoption and benefits. It was great to be able to include Paul Sonnier’s expertise on this subject! Make sure you join his LinkedIn group and follow him on Twitter @Paul_Sonnier to stay up to date on everything digital health. We looked at all the individuals engaging in the Digital Health discussion to give you the Top 50 influencers in the Digital Health landscape. Be sure to hit one of the blue buttons to download the full 2015 Digital Health landscape, including a detailed network map to better understand the debate. 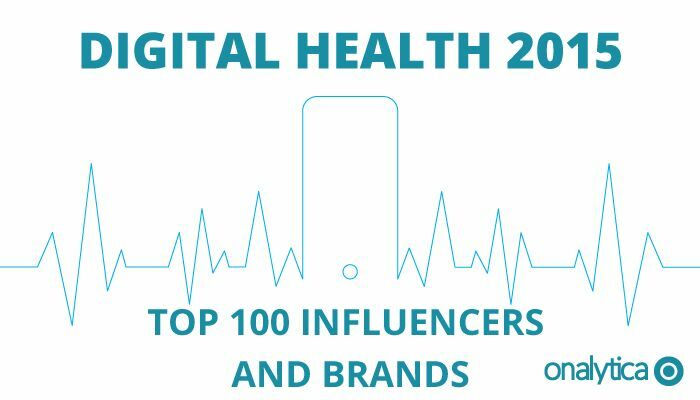 Be sure to download the full analysis for free to get an idea of who are most influential brands in the Digital Health debate. At Onalytica we love building these lists and want to give back to our loyal readers as much as we can. If you’re interested in other topics (such as Content Marketing , Wearables, Machine to Machine …) be sure to have a gander on our blog or why not propose some topics to us on twitter? 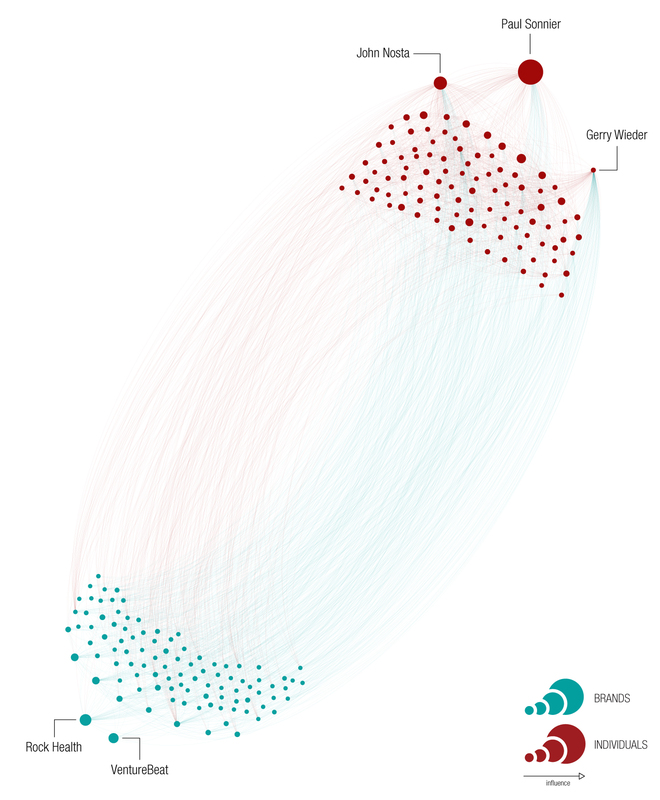 We also build some very cool software to manage all of these influencers. Get a free demo today by clicking the button below!